According to psychoanalyst Menzies Lyth, the idea that nurses and other hospital staff dehumanize and detach themselves from individuals under their care was initially studied in the principles of psychoanalysis. Following around four years ethnographic studies within various teaching hospitals, researchers have argued that nurses develop an unconscious defence mechanism to cope up with their “primitive anxieties” stimulated as an after influence of working with individuals who were dying or ill. This type of analysis also asserted the fact that nurses’ defence mechanism in hospitals, not only failed to identify the anxiety level within workers but, not fruitful to offer them with enough reassurance and work satisfaction, it also influences secondary anxiety. Although, the results were much-admired by different researchers in medical studies, they did not interpret into significant changes for hospital staff. In 2009, studies in this area underlined that it was essentially because of the absence of effective solutions for nurses regarding what should be done about reduction of the stress level. Over the prior years, a more up-to-date theory of nurses’ removal that has earned wider appeal, is offered by the theory of “emotional labour”. It has been identified that suppressing own feelings and judgements, in order to reflect desirable work-related feelings and judgements. An important tenet of the theory is that nurses are regularly subjected to control of their emotions and personality. “The control is declared by hospital managers through the reinforcement of display regulations”. An instance of this will be a nurse portraying compassion and patience, in front of incivility from a family member of a patient. Over time, the incongruity felt and expressed behaviours of nurses are thought to lead to “emotional discord” and eventually, emotional strain. This, in turn, develops the danger of burnout, considered by feelings of emotional fatigue, reduced professional pessimism and efficiency. On the other hand, in parallel with the previous concepts of nursing stress, hospital staff are reviewed to withdraw from their clients and depersonalize or objectify them, to cope with different environments. 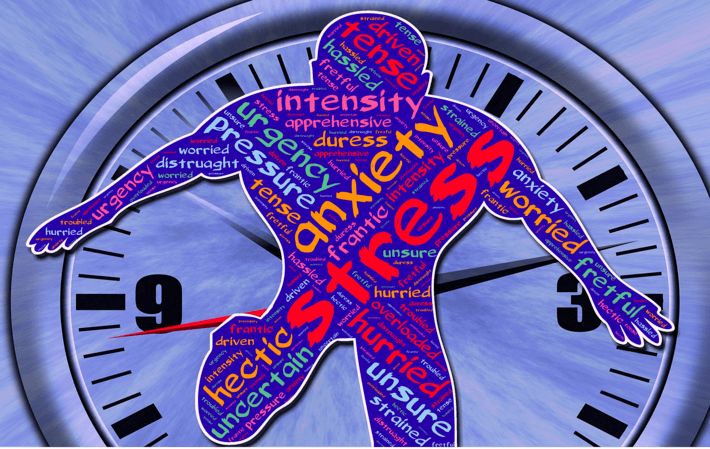 Stress could have an important influence on nurses’ health conditions and lead to exhaustion in both their individual and professional lives. This great sense of being overwhelmed sources a general change in an individual’s professional attitude, along with effective feelings of being tired, tensed regarding the future, and uninterested in hospital operations or a job. This is easy for nurses to get trapped in life and forget to take care of their individual wants and needs, specifically, when caring others if their profession. In order to remain healthy, nurses and other staffs should not look at caring themselves as relaxation or something to do occasionally. This is the need, and something, which should be practiced routinely. It has been noticed that currently, nurses’ concern with the influence working stress has on their health is a truth. As per the definition of “(NIOSH) National Institute for Occupational Safety and Health”, working stress of nurses is one of the damaging physical as well as emotional responses, which happen when the needs of their jobs do not go with abilities, resources, or individual needs of the staff. This prompts a reaction in the body characteristically suggestive of the “fight-or-flight” responses. The “fight-or-flight” responses that make the body to survive a perceived outward threat, is connected with a number of physiological alternations, which are produced by the sympathetic nervous as well as “adrenal-cortical systems”. Initiation of these schemes issues many hormones into their body, causing-among other things-develops in “heart rate, increase in blood pressure and probably a shutdown of the digestion and immune systems”. Currently, in previous years, researchers and specialists have powerfully supported the idea that job dissatisfaction and anxiety interferences of nurses must be combined of stress reduction and supervision for people with policies planned to decrease or eradicate tensed working environments to which nurses or other medical staffs are exposed to. Furthermore, various other researches have also evaluated a number of studies, which examined individual oriented, organization-cantered, and a amalgamation of both kinds of interferences and addressed that all these results about nursing stress level affirm person-focused as an important accompaniment to organizationally cantered interferences. Researchers also concluded that there is countless possibilities for developing nurses’ health with the help of integrated approaches. From the above analysis regarding nursing stress and increasing working stress in hospitals for nurses, it has been identified that as lucrative and satisfying as this is, being a professional nurse is filled with a positive level of substantial pressure, which could easily result in burnout. while working as a professional nurse, they have to stand for hours. They have been scheduled for long shifts and the emotional drain on them as they take care of several patients is phenomenal. In a nutshell, effects of working stress can result exactly in physical illness, depression, being demoralized, substance abuses, developing bitterness and anger while communicating with patients and other staff on an individual level along with poor absenteeism and turnover rates on an organizational level. After discussions about causes and effects of developing stress level in hospital staff, this is the time to discuss on possible solutions to reduce or completely eradicate the stress level. One of the effective ways to relieve stress level for nurses is by opening up to other staffs that could be trustworthy. Even in the hospitals, other staffs might not have a definite solution to what causing stress. Communicating about personal feelings with someone will put individuals in the right perspective and decreases the heavy burden of work. On the other hand, organizational management have an important role in identifying causes of stress and try to implement strategies to help their nurses. There are various coping strategies available that organizational management should implement as per their organizational capabilities. In this regard, it could be said that “cognitive-behavioural interventions” are planned to help people live longer, feeling better and avoid having any type of self-defeating concepts. This type of interventions helps individual to understand themselves so that they might live a more happy, communicative and fulfilling professional live. Organizational management should process a regular intervention session for nurses and other medical staff. Implementing “cognitive-behavioural interventions” should target individual expressions and thoughts as a cognitive procedure. This is based on the theory, which changes in emotions and behaviours of people. After that management could be able to identify what are the reasons for developing stress level among their workers and what will be the possible duties to reduce them effectively. On the other hand, reviewing and implementing an employee assistance program on a regular basis is necessary in each organization. This type of employee assistance program, for instance, “the NSW Health policy for employee assistance program” identifies a worker, be it a nurse or ground level staff, as an integral part of their organization. This type of strategic intervention provides work-based, interventions policies that offer proper, timely and confidential counselling and other referral services to the employees to help them recognizing and resolve personal health as well as professional work-related difficulties that have been arising from increasing working stress. This type of strategies is also helpful in developing an effective communication between the management and employees. Clients will also be benefitted by less working stress in hospitals as nurses can be able to work freely and become more communicative with them.